• Do not leave the bulb out of the headlight reflector for a long period of time. Dust, moisture, smoke, etc. entering the headlight body may affect bulb performance. • High pressure halogen gas is sealed inside the halogen bulb. The bulb may break if the glass envelope is scratched or the bulb is dropped. • Only touch the base when handling the bulb. Never touch the glass envelope. Touching the glass envelope could significantly affect bulb life and/or headlight performance. • Aiming is not necessary after replacing the bulb. 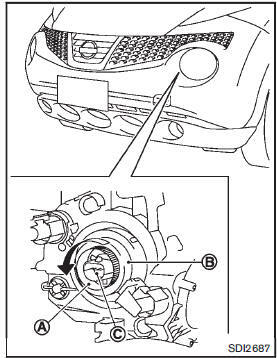 When aiming adjustment is necessary, contact a NISSAN dealer. Disconnect the battery negative cable before replacing bulbs. 2. Turn the holderA and then pull out it. Remove the cap B and then remove the bulbC .